Have you started dreaming about your perfect home? Maybe you found just the charmer you were looking for in that mid-town location but it’s a fixer upper and needs extra love and attention. The price might be within your range, but can you afford the costs of all the repairs and remodeling needed to turn it into your dream home? Good news for you - whether you’re a first-time homebuyer or looking to refinance or invest, American Pacific Mortgage has fixer upper home loans that can make purchasing and renovating a home an affordable option! These loans are called Renovation Loans. This program includes FHA 203(k) Standard or Limited Renovation Loans. Financing can include costs of upgrades whether major or minor, such as foundation repairs, remodeling of exteriors, roof repairs, and much more. Projects that are under $35,000 fall under the Limited Renovation Loans, which are more streamlined and require less documentation. These fixer upper home loan programs offer conventional mortgage options to finance your renovations. The financing can include home improvements in a purchase or a refinance and can even work for investors. Is a Fixer Upper Home Loan the Option For You? 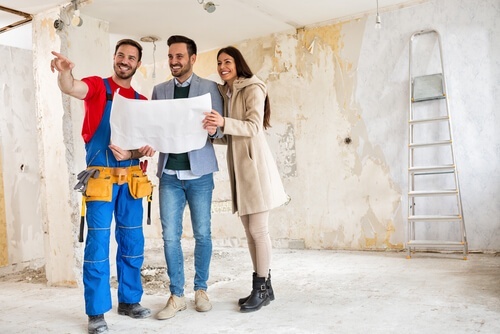 Now that you know APM has fixer upper home loans, let one of our knowledgeable loan advisors work with you to determine which renovation loan will work for your dream home. We’re happy to help you move toward fixing up a house to make it your home.